Disclaimer: This Black Friday Sales from Coupons. com & Giveaway post is a Fashionista Event. I was provided a promotional item by Coupons. com to inform you of their crazy insane Black Friday Sales, their top 10 gifts giveaway and our $500 giveaway. All opinions expressed in the post below are 100% mine and mine alone unless otherwise stated. Please do your own research before committing to purchase a product as your opinions may vary. The holidays are upon us once again and if you haven't given any thought to your holiday shopping yet, you might want to get on that! I just checked and as of today, there is only 32 more days until Christmas to get that shopping done and over with. And that's not even including all the other gift-giving holidays, parties, and even some holiday birthdays thrown in the mix either! 1. Harper's Island is a mini-television horror series that premiered back in the early 2000's which I did not miss a single episode of! I loved it then and I'd love to have the whole series on DVD now. 2. These stepped pliers will help be break into doing more wire-work with my handcrafted jewelry designs! 3. Like the stepped pliers, the bail-forming pliers will help me further my jewelry making skills, too. 4. I've wanted an Xpole since I started pole dancing 3 years ago. Still on my wish list! 5. I saw this neat old fashion telephone you talk through that plugs into your cell phone. I. Must. Have. This. 6. I've been in need of some new sports bras for pole and yoga and I love the Avia brand, which is why I added it to my list. Plus it's purple. 7. There are some pretty neat workout bags that incorporate many different compartments for your stuff like yoga mats, water bottles, workout gear, etc. and since I'm hoping to start working out again, I'd love one to keep all my gear in! 8. I was so sad when my prior television died, not so much because of the tv itself, but because it had an awesome DVD/VCR combo built in. If I can't have one build in, I'd still like a standalone DVD/VCR for my new tv. 9. I'm a HUGE Fast and Furious fan so it's no wonder I need to add the newest to my collection. Thankfully those of you, like me, who are late shoppers have a little saving grace: Black Friday! Black Friday Sales, or better known as the day after Thanksgiving, are the one time of year that you can knock out most of your shopping list while saving some much needed $$$ that can be applied elsewhere. Like more holiday shopping! Black Friday shopping gets even better with Coupons.com which helps save you MORE money on top of the already awesome sales going on, both in stores and online! From percentage discounts to free shipping offers to even letting you know about free gifts with purchase, you'll be able to find all the Black Friday Sales that suit your holiday shopping needs. 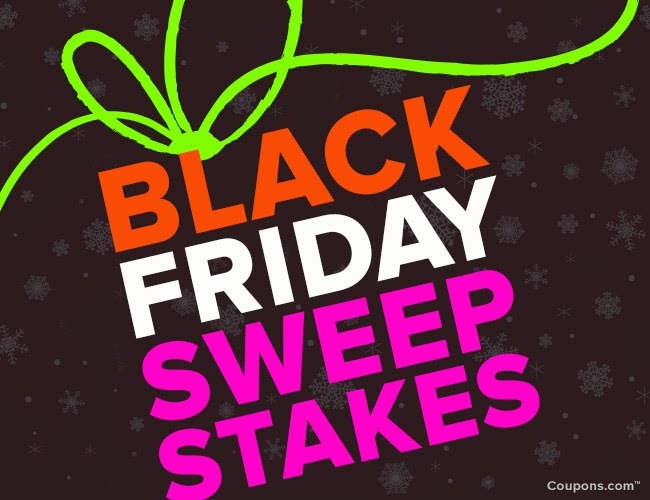 Not only can you find great deals on items on your shopping list but from November 20th through November 29th, you can enter yourself in Coupons.com Top 10 Giveaway where you can win one must-have item per day! A few of the must-have prizes you could potentially win include a Playstation 4, a Dell Inspiron 15" laptop, and a Samsung 32" tv just to name three. The best part: you can enter once a day which definitely increases your odds! Coupons. com and their Black Friday sales! I'm with you. I definitely need a few new sports bras! i love finding deals on coupons.com!! I'd use the 15% off sitewide deal at Things Remembered. They have such pretty merchandise that would make nice Christmas gifts for some of the women in my family. Great deals, but Office Depot is the way to go for me. We get all our supplies there especially ink for the printer and we know how expensive that can get. Save 20% Off All Norton Products going to update my Norton! I hate computer bugs! The free slippers with PJ purchase at Victoria's Secret. It's hard to choose but I would probably use the Carter's one! I actually love the Free Upgrade to Expedited Shipping on $30+ from Shutterfly- perfect for our Christmas cards!